Back in my early twenties, my life was dominated by fear and anxiety. I was so scared of speaking in public that I chose to drop out of business school rather than give a presentation to my classmates. I was struggling to make ends meet in a sales job because, despite generating a ton of leads, I fell apart when it was time to close the sale. My anxiety was the result of years of extreme bullying as a kid. It wasn’t until I attended a retreat in Florida that I discovered how life-changing meditation could be! Meditation is one of several tools that would ultimately help me leave this trauma behind and take back control of my life. It’s no exaggeration to say that I left the retreat a new person! Today, I help thousands of clients to use meditation for healing and empowerment, and the transformations they experience continue to amaze me. Before we take a look at the benefits, let’s explore what exactly meditation involves. Meditation holds different meanings to all who practice, but a common intention is for the person gains a greater sense of mastery over their mind and their thoughts. This can be directed towards managing stress or illness, achieving goals, changing bad habits, improving skills, or simply achieving a sense of peace in an otherwise hectic life. There are countless ways to practice, but modern meditation can be loosely grouped into two styles. 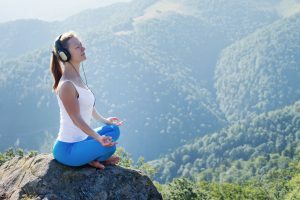 Focused-attention meditation involves concentrating your attention on a single thought, visualization, or sound — think mantras or chanting, for example. Open-monitoring, on the other hand, encourages the free flow of thoughts, requiring that you simply become aware of them and observe them without judgement. 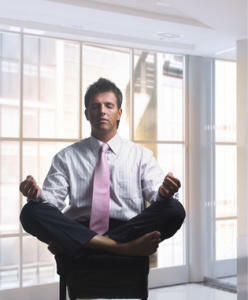 Of course, I’m a huge believer in the power of meditation, but you don’t have to take my word for it! 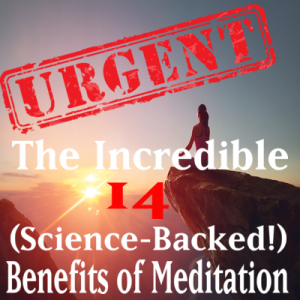 I’ve compiled some of the best scientific research (14 to be specific) showing the many incredible benefits of meditation. Check it out and see how meditation can transform your life, too! Stress is quickly becoming one of the most serious public health issues in the developed world. Left unmanaged, it leads to problems like anxiety, depression, sleep disruption, and eating disturbances. Stress is thought to contribute to painful chronic illnesses like fibromyalgia and irritable bowel syndrome. This study and another5 showed that with long-term practice, the positive anxiety-reducing effects of meditation continued indefinitely. Depression can be a debilitating disease and it’s notoriously difficult to treat, but meditation provides some hope for sufferers. Lack of sleep is linked to stress, fatigue, and weight gain, but it can be hard to switch off and get the recommended eight hours a night. Emotional intelligence refers to your ability to understand, manage, and appropriately express your emotions. If you found yourself particularly irritable and unable to keep from flying off the handle when under stress, for example, it would be said that you had low emotional intelligence. Meditation teaches you to take a step back and become a passive, non-judgemental observer of your thoughts. From this perspective, you develop a deeper understanding of your emotions and you’re able to exercise greater control over them. What we want is often in direct conflict with what’s best for us, but self-control helps us to make positive choices — resisting the urge to spend money on something we want but can’t afford, for example, or restricting ourselves to one or two drinks at the annual office party. Well, self-control is regulated by an area of the brain called the prefrontal cortex. The more we exercise self-control, the stronger this area becomes. Meditation is shown to activate this area too,10, 11 giving your prefrontal cortex a workout and boosting your willpower with every session. Research supports this, showing that meditation can help you to overcome impulsive12 and even addictive behaviors. 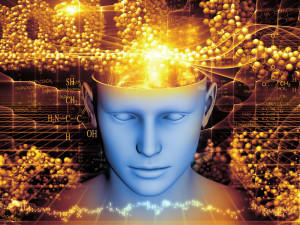 Our emotions and behaviors — both positive and negative — are rooted in the subconscious mind. Because we’re so focused on our conscious thoughts, we’re often not even aware of our unconscious motivations, let alone in a position to address them! Meditation helps by quieting the conscious mind and encouraging you to observe the natural flow of your unconscious thoughts. Meditation, particularly a type known as loving-kindness, can make you a more compassionate person, towards both yourself and others. It begins by focusing kindness, love, forgiveness, and positivity towards yourself, eventually expanding to include family, friends, and others. Multiple studies show just how effective this practice is,18, 19 and it seems the more you meditate, the more compassionate you become.20, 21 And of course, viewing yourself through a lens of love and kindness, as well as seeing yourself as a more compassionate person, naturally improves your self-esteem. A positive attitude can help to fight stress and depression, improve your coping skills, boost your social life, and even make you live longer. It makes life infinitely more enjoyable, but cultivating a positive mental attitude doesn’t come easily to everybody. The good news is that meditation can help! Anecdotal evidence from countless sources shows that meditators feel happier, more optimistic, and more resilient to stress. So we know meditation is great for every aspect of your health, but did you know that it can literally re-shape your mind? Countless studies, including a landmark Harvard study23 and work by the Dalai Lama himself24, have shown that long-term practice increases the volume of grey matter in several key areas of the brain. These include the areas responsible for learning, memory, emotional regulation, creativity, and concentration. Do you find yourself constantly forgetting why you walked into a room? Do you have to search the house for your keys every single morning? Perhaps you have a terrible memory for names or faces? Those who took part showed what’s known as ‘divergent’ thinking when asked to come up with new ideas. This is a style of thinking that encourages you to explore many different ideas and solutions, as opposed to focusing on just one. During meditation, you’re encouraged to concentrate on simply observing your thoughts, re-focusing your attention if your mind begins to wander. Many people find this difficult at first, but with practice, they find that they can concentrate and maintain their focus for much longer periods of time. Meditation studies show that this skill extends into day-to-day life. It seems you don’t need to meditate for long to feel the benefits. Incredibly, these benefits started to show up after as little as four days. Amazed at just how powerful meditation is?! Meditation has the power to improve almost every single aspect of your life. I’ve experienced it first-hand, and science agrees! If you’re ready to find out for yourself, I have a special Mindfulness Meditation you may be interested in. Simply click on the play button below to get started!